Global PINS Codes can be CUSTOMISED and used on any event you create in your EventDesq module, and any entry type without restriction. These codes are DISCOUNT CODES ONLY. This means you can create a Global PIN that could offer anyone who had the code a $20 discount or a 20% discount, to any event and any entry type you have created. 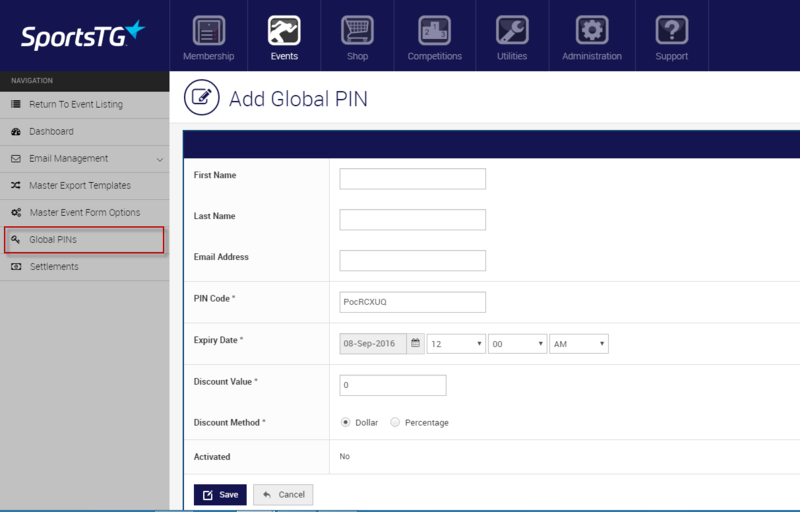 To create a SINGLE GLOBAL PIN please click EVENTDESQ > GLOBAL PINS > ACTIONS > ADD. First & Last Name: this can be an individual if you’re awarding it to someone as a prize or promotion. It can be a business name is you are giving it to a sponsor or event partner. Email Address: this can be for an individual or business, it’s purely for contacting purposes. PIN Code: a unique system created PIN will already be created for you. You can either use this unique PIN or create your own PIN. The PIN can be made up of letters (both lowercase and uppercase), numbers, or both as demonstrated with the system created PIN. Expiry Date: select a date when you want the PIN to expire (ie it will no longer work). Discount Value & Method: select the dollar or percentage discount you would like to offer. Activated: cannot be changed. This area will change to ‘yes’ once an entrant has used the PIN. To create MULTIPLE GLOBAL PINS please click EVENTDESQ > GLOBAL PINS > ACTIONS > ADD MULTIPLE. Prefix: this area is used as an identifier. It can be the letters of your event (ie RTTB for ‘Run to the Beat’), or the letters of a sponsor (ie ANZ for Australian National Bank). Number Required: this is how many individual PINS you would like created. If you need 15 Global PINS for ANZ who is a sponsor, then place the number 15 in this area. The Global PIN Listing will list every single PIN code you create, as well as all of the multiple PIN codes you create. Once they have been redeemed, their status in the ‘Activated’ column will change to YES and the relevant EventDesq form they redeemed them on will also be listed. You can view, edit and delete any of the Global PINS you create at any time before they are activated. Once activated, the PINS cannot be edited or deleted.